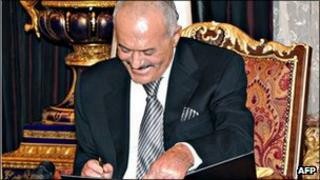 Middle East papers generally welcome the agreement signed by Yemeni President Ali Abdullah Saleh in the Saudi capital, Riyadh, which paves the way for him to leave power. Several commentators see the deal as a turning point in the months-long conflict in Yemen. One Qatari editorial describes the agreement as "a new era" for the country, while a Palestinian editorial suggests that the deal may be Yemen's "first step towards democracy." While Yemeni and Saudi pro-government newspapers say the agreement is a positive development, one pan-Arab newspaper commentator sounds a note of caution, saying that Mr Saleh's deal will not end the crisis and that the Yemeni people still have "a very long way to go." All Yemenis deserve congratulations on this great achievement… All the political parties should realise that the country's destiny relies on the credibility of their positions, the sincerity of their intentions and their commitment to the promise they made when signing the agreement. Yesterday, Riyadh witnessed a decisive historic moment… The coming three months require all parties to commit to the agreement's articles until the agreed-upon early presidential election is held. President Ali Abdullah Saleh's signing of the power transfer agreement places the country for the first time on a relatively long road to solving the ongoing crisis. Yemen has entered a new era… [the agreement] has opened the door to ending the severe crisis that the country has been witnessing for more than 10 months. The agreement is not perfect and does not address the demands of the different parties… but nevertheless, it provides an exit from the crisis and ends [the conflict]. It may even be the first step towards democracy in a happy Yemen. [Mr Saleh] wanted to appear as the man who makes sacrifices for the sake of his country. This is a political game... The question now of course is: Has the crisis in Yemen ended? The answer is no... The Yemenis have a very long way to go.